Home » This Weeks Historical Events » Historical Events (October 2–October 8): Where were the Cubs? Despite it’s sorry state in 1915, West Side Grounds has seen some of the most glorious moments in Cubs history. 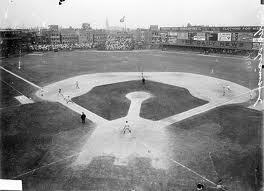 It was the home field for four World Series teams (1906, 1907, 1908, and 1910). It is the place where Tinker, Evers and Chance played their entire career together. But during this last game at West Side Grounds, only two players remain from that last championship team–Heinie Zimmerman and Frank “Wildfire” Schulte. The Cubs beat the St. Louis Cardinals 7-2. Hippo Vaughn gets the win; his 20th of the season. The team finishes the season in fourth place, seventeen games behind the National League Champion Phillies. By opening day of the following season they are playing in the ballpark they still call home today. October 2, 1985. Actor Rock Hudson dies of AIDS at the age of 59. In Chicago Rick Sutcliffe finishes off his injury-plagued season with another loss, 9-4 to the Pittsburgh Pirates. Johnny Ray’s 3-run homer in the 6th finished him off. October 3, 1990. East Germany and West Germany reunite to form one Germany after 45 years as two nations. The Cubs play their final game of the season. Greg Maddux beats the Phillies for his 15th win. October 4, 1972. Ted Williams manages his final game, a 4-0 loss for the Rangers. In Chicago, Billy Williams wins the batting title by going 1 for 3 in the final game of the season. October 5, 1945. “Meet the Press” debuts on radio. The Cubs play Game 3 of the World Series against the Tigers in Detroit. Claude Passeau pitches a 1-hitter for the win; one of the greatest pitching performances in World Series history. October 6, 1908. The Tigers beat the White Sox 7-0 to win the pennant. The Cubs are in New York preparing for a one-game playoff between them and the Giants to determine which team will face the Tigers in the World Series. October 7, 2003. Gray Davis is recalled as Governor of California, opening the door for Governor Arnold Schwarzenegger. The Cubs play Game 1 of the NLCS at Wrigley Field against the Florida Marlins. Mike Lowell wins the game for the Marlins 9-8 with an eleventh inning home run off Mark Guthrie. The most famous person in the world, Pope John Paul II visits Chicago: the brand new Polish Pope, visiting a city with 500,000 Polish people, the second largest Polish population (after Warsaw) in the world, and a city with one of the largest Roman Catholic populations in America. Needless to say, this is a very big deal. Chicago goes absolutely apoplectic at the Pope’s arrival. They cheer as his motorcade drives from O’Hare to downtown via the Kennedy Expressway. He is in the back seat of a limosine that had been specially lighted so the light shines down on his face. The limo drives at a slow, steady pace, which allows everyone to wave to him. He smiles and waves back to the crowds. First he gives a speech at Quigley Preparatory Seminary South in front of 350 bishops. During his 40 hours in Chicago, he also says mass on Chicago’s south side. Part of 43rd street near Five Holy Martyrs Catholic Church is renamed after him. The Catholic school at that church is now called Pope John Paul II School. Unfortunately, the blessings the Pope brought to Chicago didn’t travel far enough north in the city, because in the days before he arrived and the days after he left, the Cubs made two of their biggest boneheaded moves. Two days before Pope John Paul II landed in Chicago, the Cubs announced the name of their new manager: Preston Gomez. Gomez’ track record included one of the worst winning percentages in baseball history (.392). He had managed for the Padres and the Astros and was a colossal failure both times. Needless to say the same thing happened with the Cubs. He didn’t make it through the entire 1980 season before he was fired. The Cubs were 39-51 at the time. The other boneheaded move was trading promising reliever Donnie Moore for washed up infielder Mike Tyson. Tyson couldn’t hit, and didn’t last with Cubs. Donnie Moore, on the other hand, went on to become one of the best closers in baseball. Unfortunately for Donnie, he had one really bad game for the California Angels against the Boston Red Sox in the playoffs (costing the Angels a shot at the World Series). He was never the same after that and took his own life a few years after he retired. It wasn’t looking good for the Cubs in the first game of the 1907 World Series at West Side Grounds. In front of a capacity crowd, and ace pitcher 23-game winner Orval Overall on the mount, and despite keeping star Detroit Tigers star Ty Cobb hitless, the Cubs were down 3-1 going into the bottom of the ninth. The Cubs must have been worried that they were faltering at the wrong time again, but this time they also knew they had the heart of their lineup coming up against Wild Bill Donovan; 1B Frank Chance, 3B Harry Steinfeldt, and C Johnny Kling. Chance didn’t disappoint. He stroked a single into right field. Steinfeldt had been the team’s top RBI man all season, but Donovan didn’t give him the chance to beat him. He plunked Harry high and tight. With runners on first and second, Johnny Kling tried to bunt the runners into scoring position, but he got under it a bit and popped it up to hard charging first baseman Claude Rossman. That brought up future Hall of Famer Johnny Evers. Evers slapped at Donovan’s offering, and it went to Tigers third baseman Bill Coughlin. Coughlin bobbled it, and by the time his throw got to first base, Evers was safe. The bases were now loaded for one of the big sticks in the Chicago lineup–Wildfire Schulte. Schulte hit the ball between first base and second base, and Rossman made a nice play to grab it. Donovan ran over to cover first in time to get Wildfire at first base, but Frank Chance scored on the play. That made the score 3-2, with runners on second and third. But now there were two outs, and the Cubs weakest hitter Del Howard was up to bat. Donovan took care of business and Howard swung and missed strike three…but the catcher Boss Schmidt couldn’t handle the pitch, and skipped past him. Howard hustled toward first base, beat the throw from Schmidt, and Harry Steinfeldt scored the tying run on a strikeout of all things. The inning ended when Johnny Evers tried to steal home, and the game ended after the 12th inning in a way it couldn’t possibly end today. It was a tie. Umpire Hank O’Day called it a draw.